Creative groupings can be a fun and interesting way to show off your product! Let’s talk about what these types of shots can look like, how they’re priced, and the best way to provide shot directions for these shoots. Your product can really stand out with photos like these, setting you apart from competitors or other sellers! What is a creative grouping? A creative grouping is just a shot that includes multiple items and props styled around the product. These shots are priced like standard group shots based on the number of total items in the shot. A good example of a creative grouping is the photo below. Styling these products with the fresh leaves gives a clean, fresh look to the photo! When providing shot directions for creative groupings, it’s important to get as detailed as possible. There are two methods of providing shot directions for these types of photos. A cell phone photo or a similar match image, will let our photographers know exactly what you're looking for. These images don’t have to be perfect - just set up the product on your desk and arrange it how you’d like it to look in the photo. These photos come out looking amazing with the white background! A design image can be simple or complex, and you don’t have to be an artist to make one. If you feel comfortable using Photoshop or even basic photo editors to copy+paste images of props or products into the arrangement you’d like. A cell phone photo is easier because you can lay everything out by hand yourself, but if you don’t have access to some of the products or props then this method might work better. Below is an example of a complex stylized photo. 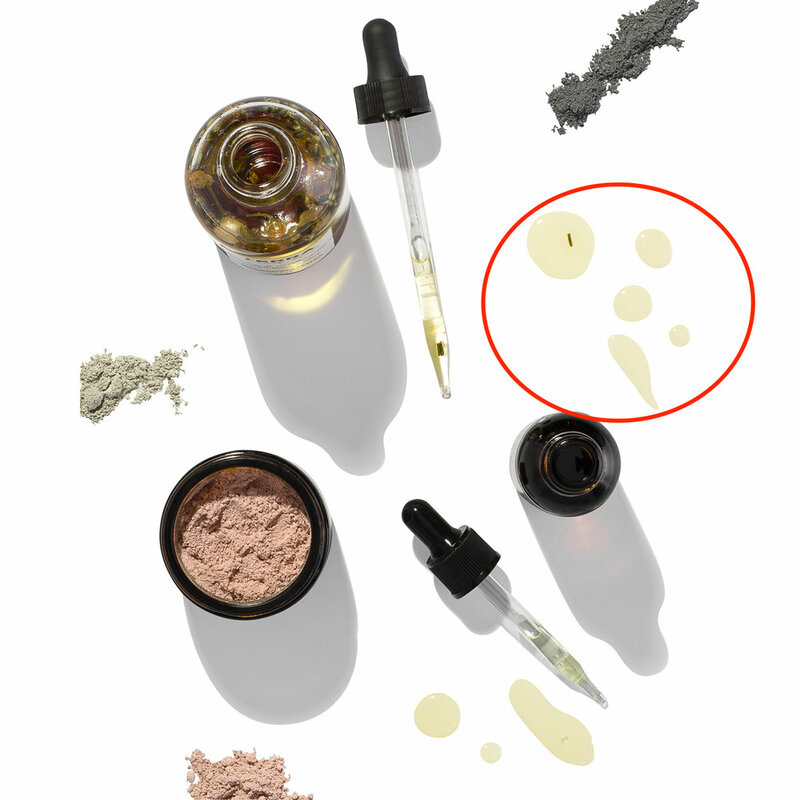 The oil droplets and loose powder props can be referred to as the “elements of chance,'“ meaning that their styling could likely not be replicated exactly. For items such as these, positioning or styling changes are determined during the shoot and arranged to look as good as possible alongside the products. There’s an infinite number of ways these items can be styled and shot, and without on set art direction it’s simply impossible to control things such as the specific way the powder falls or the shape of the oil droplets. It’s important to keep in mind that things such as minor position or styling changes for the elements of chance would not qualify for a free reshoot in the event the photo doesn't meet your needs. In the event you need to make changes like this during the shoot, a traditional photographer may be a better option. If you don’t sweat the small stuff, stylized shoots like these can be a great way to make your products pop on your page at a fraction of the cost of a traditional shoot. You can really stand out with cool, stylized photos! These are things to keep in mind when ordering and setting up your list of shot directions. For information on how to put together detailed shot directions for your photos, visit this page. Start your order by clicking the button to the right, or the Place Order button in the top right corner of our website. Placing your order for photos with creative groupings will be similar to ordering regular images. Important things to note and review before placing your order will be the group photo options and setting up your shot directions. Make sure to select the correct option in the category for Group Photos: # Of Items In The Photo. Props count as items! If you’re not sure about how to count the number of items in the image, contact us beforehand. After you order, you’ll need to provide detailed shot directions. For orders like this it’s required to send match images and very clear positioning and styling information in your shot list. Reference the section above for examples of providing shot directions for creative grouping photos. For a step by step guide that covers all the options available in the ordering form check out our How To Place Your Order page!